Well, 2014 has been fun so far! After a nice easy start to the year, including some nice little accolades (as per previous posts) and Australia winning The Ashes; I played my first show last Sunday, supporting Matmos (USA) and Always in Melbourne. Really enjoyable show, was happy with my set, Always was superb, and Matmos were stunning too! I was fortunate to be traveling around the country with Drew/Martin of Matmos as their tour manager/dropbear keeper-away-er; with performances at Sydney Festival and MONA FOMA as well as the Melbourne club show. 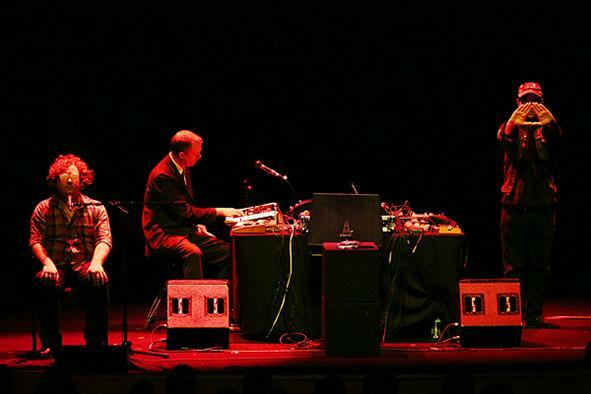 Was involved with the first track of each Matmos show too which was super enjoyable. Here’s a photo of my part of the show (credit to thevine.com.au and Prudence Upton!). There’s some reviews here, here, here and here of the Sydney show. I was fortunate enough the whole week to experience a wide range of exciting music, which put me in a great place for the show on Sunday, and for future live sets this year. Nothing on the horizon right now, working on some music and preparing for some releases in the next few months to tour around (see previous posts). In other news, here’s a nice review by Cyclic Defrost of Venation, a compilation by Brisbane label Duskdarter which I have an exclusive track on. Free download, give it a go!